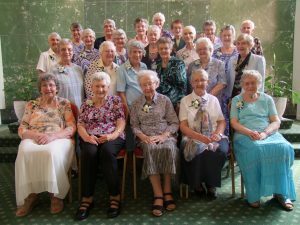 On Friday 11 January 2019, twenty-four Sisters of Saint Joseph celebrated 60 years of Religious Profession. Five more Sisters were unable to be there however, were with the group in spirit. A jubilee is a marker along a journey that began for us in 1956. We celebrate 60 years of apostolic endeavour. As we reflect on these years we share with you some moments along the way. Here are our voices. My journey has been like a pathway, with pebbles of many shapes, sizes and colours. 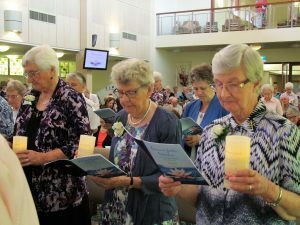 I followed God’s call to serve in country, and city schools then the path branched into Aged Care, and country parishes. All the time I saw God in my life, in faith, trust, blessings and surprises; sometimes in illness, obstacles and change. God helped me see Him in the people and in the world around me. God has gifted me with a full and rewarding life. My journey over these last 60 years has been richly blessed. Overall I have enjoyed good health, happy communities and interesting and varied work, the majority of my time was in the country, a great love. My God is one of overwhelming love, and faithfulness, and I am most grateful. My journey was from Ireland to Australia, now my beloved second home. We have been called Brides of Abundance, and that has summed up my whole experience. To stand at the reception desk at Baulkham Hills was to be flooded with emotion, expressed in tears of joy and gratitude. We left home young vibrant women full of dreams, we return now, still full of dreams and now more aware each moment of the mystery and wonder of our Godin the lives of each of us. My pilgrimage over 60 years has been a journey in a spiral both outward and inward that has been enriching, challenging and often surprising. Inwardly there has been a deepening call to prayer, reflection and spirituality-an experience of fathoming the mystery of God and the Universe. Slowly deepening in calm serenity, reflecting the sky.